It’s amazing how delicious many dishes still are, even if they are the product of 30-minute meals, quick-cook boxes, and other cooking styles that require effortless and almost brainless cooking. I myself do these dishes once in a while, especially when I’m tired, when I want to be practical, or when I just don’t have time to slug it out in the kitchen. Still, there are a lot of dishes that still require good ol’ fashion cooking in the kitchen. I’ve always found cooking therapeutic, and if time will permit me, I don’t mind spending hours — even a whole day — in the kitchen. After all, if you want the greatest eating pleasure, there are dishes that you simply cannot rush. The ragu is a popular meat-based pasta sauce that you just cannot rush. It’s a sauce that involves meat and tomatoes, and is usually referred to as a “tomato sauce.” However, Italians are quick to point out that it is really more a meat sauce rather than a tomato sauce. The best ragu is given time to simmer. You give the meat hours to lend its flavor to the tomatoes, and to also allow it to absorb the best flavors of the latter. And oh, let’s not forget — I put wine into the ragu, which takes time to be absorbed. That is why authentic ragu cannot be done in an hour! 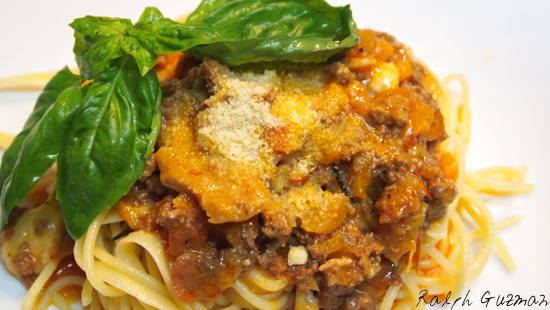 Here is my recipe of a slow-cook ragu. It takes a total of 6 to 7 hours to cook! Like many pasta sauces, this recipe allows you to be flexible and creative. So, feel free to improvise to suit your taste. I also won’t be mentioning a lot of measurements here. Measurements will depend on how much sauce you want to make. (Thank you in advance for bearing with me as this post may be quite a read). If you also read on, you’ll also see a good tip I learned from an Italian chef to make your noodles taste even more delish. 1) I start off by sauteing garlic on a non-stick pan, low heat, for about a minute, to bring out the flavors of the garlic. I then saute ground beef, chopped bacon, and chopped chorizo. The chorizo gives the dish an extra meaty kick. I loved how much better the sauce tasted with the chorizo. Spanish chorizo is the best! Note on the beef: You can use ordinary ground beef. It will taste more delicious, however, if you use ground sirloin. When I use ground sirloin, I choose the meat myself and have the butcher grind it. 2) After about a minute, add salt and pepper, chopped onion, carrots, celery and finely chopped tomatoes. To maximize the flavor, you can use a combination of 50% fresh tomatoes and 50% canned tomatoes. Add pepper. 3) To bring out the flavor of the ground beef, add one to two tablespoons of soy sauce. The Italians don’t put soy sauce, but from experience, soy sauce really does draw out the flavors of the beef. Add thyme, and bay leaves (you can use dry bay leaves). Stir until the ground beef starts to brown. 3) Add 1 to 1.5 cups of red wine. Simmer for 2 minutes. 4) Then add a 1 cup of tomato paste. Stir until the paste gets fully incorporated. 5) Transfer everything into your slow cook and leave it covered with the lid for 6 to 7 hours. Don’t worry if it does not look like pasta sauce yet. Have faith. Give it time and things will come around. If you don’t have a slow cooker, you can use your stove. Use low heat, and make sure you use a non-stick pot. Otherwise, the meat will stick to the pan. This is how it will look like in a few hours. 6) 30 minutes before you end the cooking, add 1 cup of full cream milk, grated cheddar cheese, and parmesan cheese. These dairy products will neutralize the acidity of the tomatoes and give the sauce a creamy texture. Dairy products spoil fast, and so I only put these ingredients towards the end of the cooking. Feel free to add more pepper if desired. I start tasting the sauce at this point, and the truth, I find it hard to stop tasting the sauce because it really tastes spectacular at this point! Haha. By this time, your pasta noodles should be cooking already. Make sure to season the boiling water with a generous amount of salt. 🙂 You can use your favorite pasta noodles. As for me, I always love using linguine, spaghetti, and fetuccine for sauces like this. 7) Once the pasta noodles are 90 seconds away from being cooked, take them out of the water, place them in a big container (container should be enough for you to pour in the sauce and mix it well). Don’t pour the sauce just yet. Here’s the secret tip: before you pour in the sauce, mix in two knobs of butter. 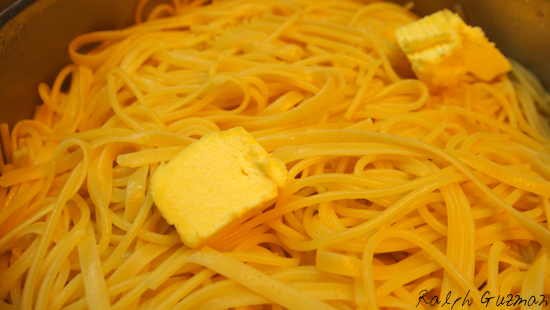 The noodles will absorb the flavors of the butter. Yum! The joy of cooking with butter! 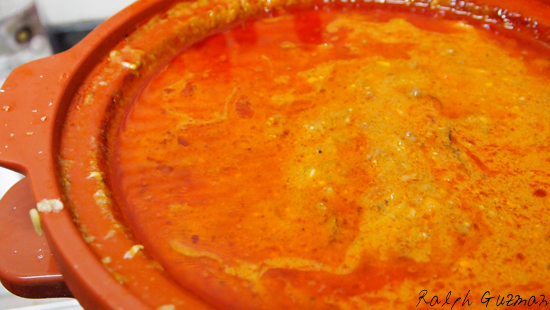 8) Pour in the sauce and mix well. Top with freshly ground black pepper and Parmesan cheese. Add a drizzle of olive oil, and top with fresh basil. The basil provides a wonderful, nutty contrast to the sauce. For extra crunch, by the way, you can also top the pasta with chopped toasted bacon. Rachael Ray, this dish is more than 30 minutes but it is definitely worth the wait. 🙂 Enjoy the dish, friends! Buon appetito! This entry was posted in Food + Recipes, Pasta + Noodles and tagged Meat Sauce Pasta. Recipe for Ragu, Meat Sauce Recipe, Meat Sauce Spaghetti, Pasta Meat Sauce, Ragu, ralph guzman, RatedRalph.com, Slow Cook Ragu, Slow Cook Ragu Recipe, Slow Cooked Ragu, Spaghetti with Meat Sauce by Ralph. Bookmark the permalink. ← Previous Previous post: We're back — almost.